Everyone knows how easy inflatable kayaks are to store and transport. 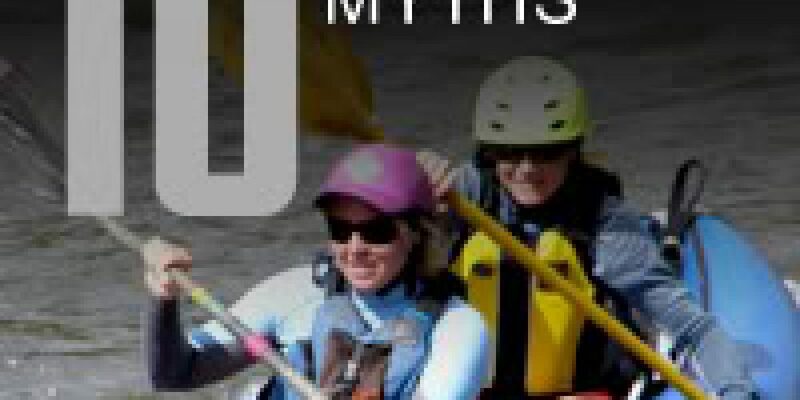 But there are a lot of misconceptions about inflatable kayaks. Most of these are perpetuated by the poor performance of cheap blow-up rafts sold at sporting goods and department stores during spring blowout sales. That’s not what you get when you invest in a Sea Eagle Kayak. That is probably true of the swimming-pool toy you bought for your kids. Modern inflatable whitewater kayaks are a different breed. While punctures can happen, they rarely do. Most of the time the heavy-duty PVC outer shell bounces right off the rock without incident. I remember paddling around a lake in a little rubber raft. Every time I took a stroke on one side the raft spun around in a circle. It was like paddling an inner tube. I couldn’t control it and it took me forever to get from one side of the lake to the other. But, well-made inflatable whitewater kayaks track well across the water and allow you to maneuver quickly on the river. The Sea Eagle Explorer 380 and 420 are Class IV Whitewater kayaks and many other manufacturers sell inflatable kayaks that perform amazingly well in class IV whitewater. Because inflatable kayaks don’t have an enclosed cockpit, you may think that inflatable kayaks will fill up with water more easily than their hardshell counterparts. But a good whitewater inflatable kayak is self-bailing. There are holes in the floor in the seams of the boat that allow any water to quickly drain out the bottom of the boat. You might think since a traditional hard-shell kayak has an enclosed cockpit, you won’t get wet. But a traditional kayak just doesn’t keep all the water out, especially in breaking waves and whitewater. The skirt is not waterproof either, and most hard-shell kayakers come out pretty wet anyway. The cockpit and skirt are designed to keep enough water out of the boat to prevent capsizing but it never stays completely dry inside. Inflatable kayaks sit much higher out of the water, so if you are paddling on flatwater, you will likely stay just as dry as if you were in a cockpit if not more so. If you want to stay dry, wear a drysuit. That goes for both enclosed cockpit kayaks and inflatable kayaks. Inflatable kayaks often have a wider base than hardshell kayaks. This makes them incredibly stable even in large waves. I can’t count the number of times I’ve seen a hard-shell whitewater playboat get tossed around on a wave that an inflatable kayak handled easily. First of all, kayaking isn’t about being serious, it is about having fun. But to answer this question, check out the Aire’s blog. The upper clackamas whitewater festival had many whitewater competitions for inflatable kayaks, giving out prizes for the top competitors. 8. Myth: Inflatable kayaks can’t eskimo roll. If I fall out, I won’t be able to get back in. True, inflatable kayaks were not designed with the eskimo roll in mind. But if you bounce out of your inflatable kayak, it is not too difficult to get back in. I’ve seen kayakers bounced from their boats in the middle of a huge rapid and bounce back in and keep paddling in seconds. Of course this takes practice, but so does the eskimo roll. And if you outfit your inflatable kayak with thigh straps (available on request), chances are you won’t fall out of your kayak in the first place. Remember blowing up that floating mattress for your swimming pool? After a few minutes of furiously puffing the raft was nowhere near inflated and you started to see spots as you hyperventilated on the valve stem. Fortunately inflatable kayaks come with a hand pump that quickly inflates the boats, pushing air into the boat on both upward and downward strokes. It’s true you can’t roll in an inflatable kayak. You won’t be doing enders, cartwheels, blunts, or the McNasty. But would you really be doing that anyway? Unless you dedicate your life to the art of playboating, you’ll be using your boat to ride waves, play in holes, and enjoy the natural surroundings. This is where inflatable kayaks excel. Most beginners who try inflatable kayaks are more comfortable on the water and start having fun much more quickly than those in hardshell kayaks. I love my hardshell kayak, and use it all the time. But when I recommend kayaking to my friends, I always recommend inflatables since I know they will start having fun right away.